The study found a "footprint of metal in the population,” Mozhgan Savabieasfahani, one of the lead authors of the report said. Savabieasfahani is an environmental toxicologist at the University of Michigan's School of Public Health. "In utero exposure to pollutants can drastically change the outcome of an otherwise normal pregnancy. The metal levels we see in the Fallujah children with birth defects clearly indicates that metals were involved in manifestation of birth defects in these children," she said. The study's preliminary findings, released in 2010, led to an in-depth inquiry on Fallujah by the World Health Organization (WHO), the results of which will be released next month. The inquiry is expected to show an increase in birth defects following the Iraq War. An UK government spokesperson also said there was no "reliable scientific or medical evidence to confirm a link between conventional ammunition and birth defects in Basrah. All ammunition used by UK armed forces falls within international humanitarian law and is consistent with the Geneva Convention." 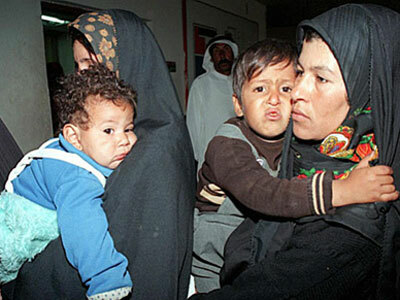 US uranium to blame for deformed babies in Fallujah?